Highlights provides a unique opportunity to view the growing collection of Indigenous art in the Redland Art Gallery Collection, including artwork specific to the region. Artworks by nationally recognised artists Oodgeroo Noonuccal, Ngarra and Gladdy Kemarre are a feature of this exhibition. Curated by Megan Imber and Kate Stewart. 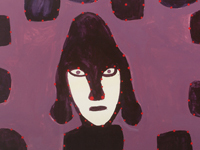 Image: Ngarra, Yarralil (detail) 2006, synthetic polymer paint on paper. Acquired in 2006 with Redland Art Gallery Acquisition Funds. Reproduced courtesy of the artist’s estate and Mossenson Galleries.